There is a community of experts who can help you in caring for your patient with PNH. Let us find the right person to assist you in providing your patients with PNH with the best care possible. References: 1. Rother RP, Bell L, Hillmen P, et al. The clinical sequelae of intravascular hemolysis and extracellular plasma hemoglobin: a novel mechanism of human disease. JAMA. 2005;293:1653-1662. 2. Hill A, Richards SJ, Hillmen P. Recent developments in the understanding and management of paroxysmal nocturnal haemoglobinuria. Br J Haematol. 2007;137:181-192. 3. Nishimura J-I, Kanakura Y, Ware RE, et al. Clinical course and flow cytometric analysis of paroxysmal nocturnal hemoglobinuria in the United States and Japan. Medicine. 2004;83:193-207. 4. Lee JW, Jang JH, Kim JS, et al. 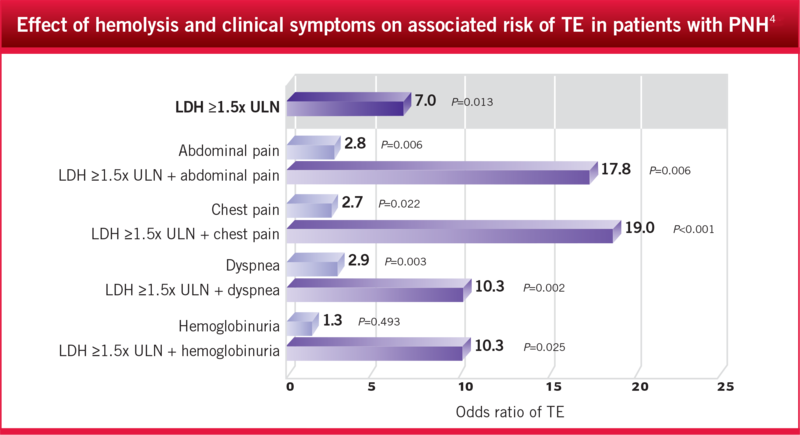 Clinical signs and symptoms associated with increased risk for thrombosis in patients with paroxysmal nocturnal hemoglobinuria from a Korean Registry. Int J Hematol. 2013;97:749-757. 5. Parker C, Omine M, Richards S, et al; for International PNH Interest Group. 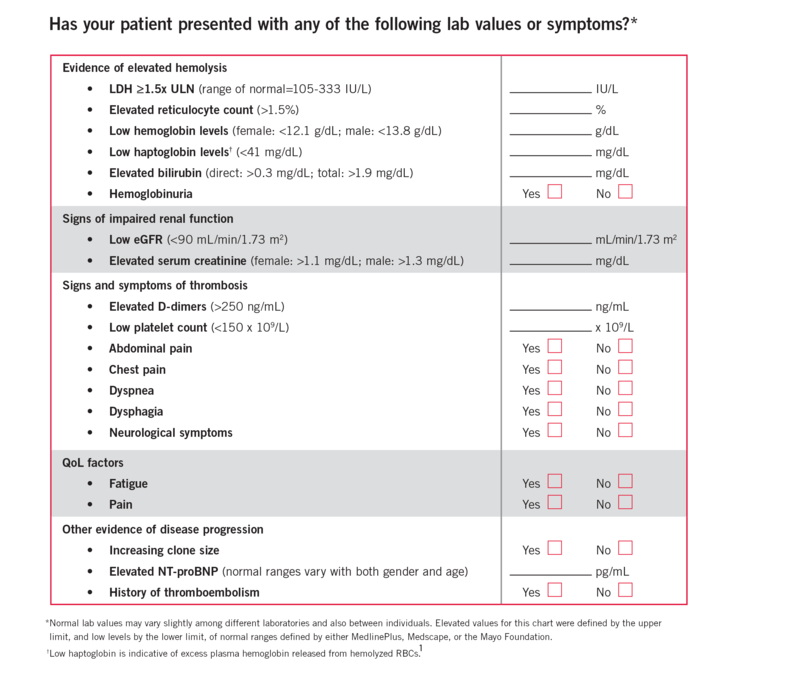 Diagnosis and management of paroxysmal nocturnal hemoglobinuria. Blood. 2005;106:3699-3709. 6. Hill A, Rother RP, Wang X, et al. Br J Haematol. 2010;149:414-425. 7. Weitz I, Meyers G, Lamy T, et al. Cross-sectional validation study of patient-reported outcomes in patients with paroxysmal nocturnal haemoglobinuria. Intern Med J. 2013;43:298-307. 8. Movalia M, lllingworth A, Weitz I, et al. Poster presented at the 53rd Annual Meeting of the American Society of Hematology; December 10-13, 2011; San Diego, CA. Abstract 1033. 9. Lee JW, Jang JH, Kim JS, et al. 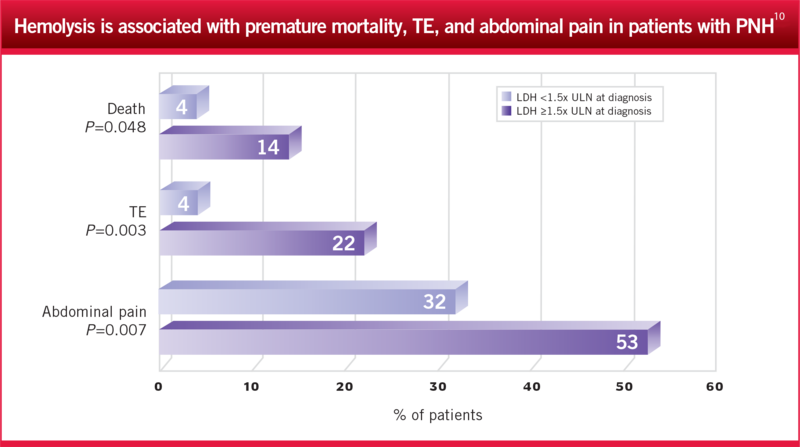 Uncontrolled complement activation and the resulting chronic hemolysis as measured by LDH serum level at diagnosis as predictor of thrombotic complications and mortality in a large cohort of patients with paroxysmal nocturnal hemoglobinuria (PNH). Blood. 2011;118: Abstract 3166. 10. Kim JS, Lee JW, Yoon SS, et al. Association between elevated hemolysis at diagnosis and early mortality and risk of thrombosis in paroxysmal nocturnal hemoglobinuria (PNH) patients with cytopenia. Blood. 2010;116: Abstract 4241. 11. Urbano-Ispizua A, Schrezenmeier H, Brodsky R, et al. Evaluation of paroxysmal nocturnal hemoglobinuria disease burden in patients enrolled in the International PNH Registry. In: Abstracts of the 15th Congress of the European Hematology Association; June 10-13, 2010; Barcelona, Spain. Abstract 1022.